The cool climate of the Clos Windsbuhl is ideal for late ripeness, as the botrytis develops late and more often into noble rot. Certainly the higher altitude and direct proximity of the forest influences the local climate of the Clos. Usually calcareous soils are associated with important layers of marl or clay, which have a cooling effect, but this isn’t the case in the Windsbuhl. The Muschelkalk rock is quite poor, there are a lot of rocks in the vineyard, and this helps to compensate the cooler climate, by allowing the soil to warm up quicker, especially late in October, when the sun is rarer. The proximity of the forest, some grazing land (where we keep our sheeps) and a small lake (pound) also help biodiversity. It is in the Windsbuhl and Rangen that we find the widest range of plants growing wild. 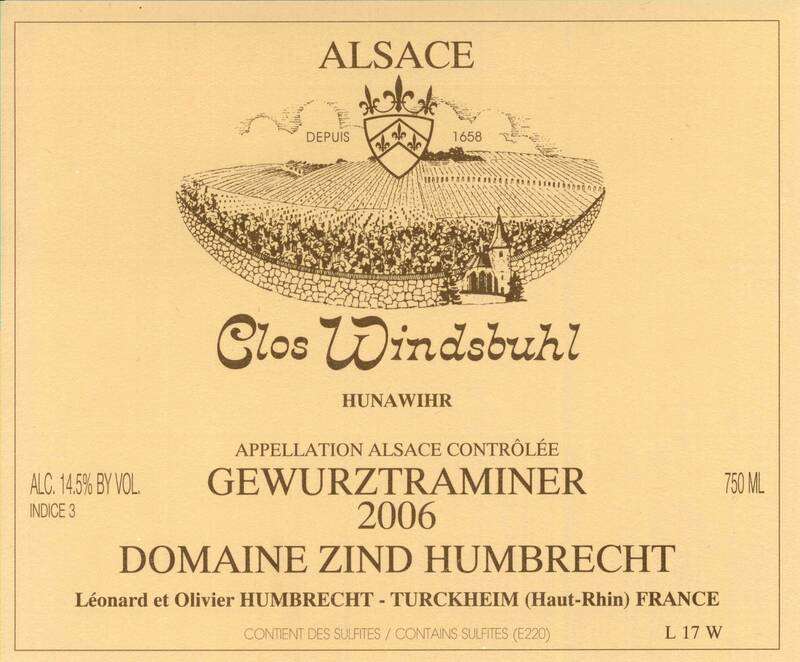 The 2006 Windsbuhl was harvested very ripe, at the limit of VT, and kept a significant amount of sweetness. 1/2008: the nose is typical of the Windsbuhl vineyard: lots of elegant/delicate floral influence, but nothing is extravagant. It is a very subtle wine. The palate shows sweetness, not the kind that really makes it a dessert wine, but enough to make it also enjoyable without food. There is good acidity on the finish, but this is classic for the Windsbuhl, I shouldn’t have to mention it.